New Delhi, February 6: Being culturally rich, India has many neighbours with whom it has traditionally maintained welcoming and good neighbourly relations, especially with China. 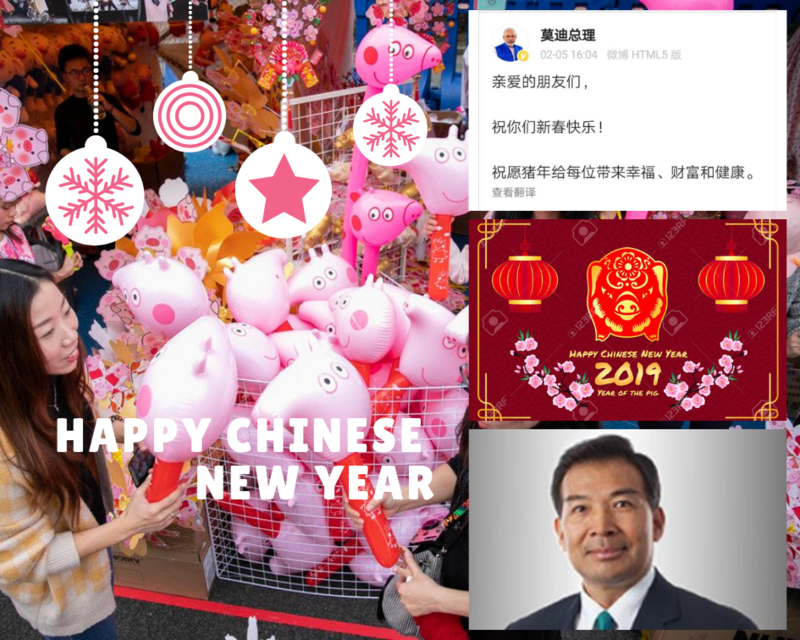 Citing the occasion of the Chinese new year on Tuesday, Prime Minister Narendra Modi greeted the Chinese people wishing them a happy and prosperous Year of the Pig. Meanwhile, the Indian Ambassador to China, Vikram Misri also shared special greetings on the occasion. “May this year be of good fortune and happiness for everyone. 2018 was a moment for India-China ties. The Wuhan Summit in April last year, set the tone for the positive momentum in our relationship and the visit of state councillor in India highlighted the common intent on beginning of our people to people exchanges. In this new year, I welcome all my Chinese friends to visit India and experience its rich, diverse and unique culture”, he said. Chinese people all over world bade farewell to the Year of Dog and welcomed the Year of Pig on 5th of February ushering in the Lunar New Year with prayers and family feast. Chinese New Year is the festival that celebrates the beginning of a new year on the traditional Chinese calendar. The festival is usually referred to as the Spring festival in mainland China and is one of several Lunar New Years in Asia. Observances traditionally take place from the evening preceding the first day of the year to the Lantern Festival, held on the 15th day of the year. The first day of Chinese New Year begins on the new moon that appears between 21 January and 20 February. This year, the first day of the Chinese New Year was on 5th of February, initiating the Year of Pig.